As late as Oct. 9, Sarasota County staff still was anticipating that a swap with the Florida Department of Transportation (FDOT) involving River Road and roads on Siesta Key would be concluded by the end of this calendar year. 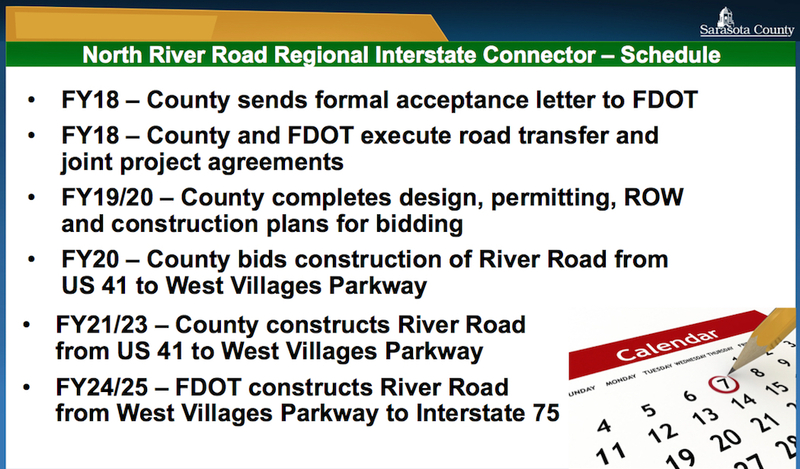 However, in response to a Sarasota News Leader request for an update this week, county staff said that instead of wrapping up the swap prior to Dec. 31, FDOT plans just to submit to the county a draft road transfer agreement. While the county commissioners may be disappointed about that, FDOT did have a significant proverbial “carrot” to temper the news. 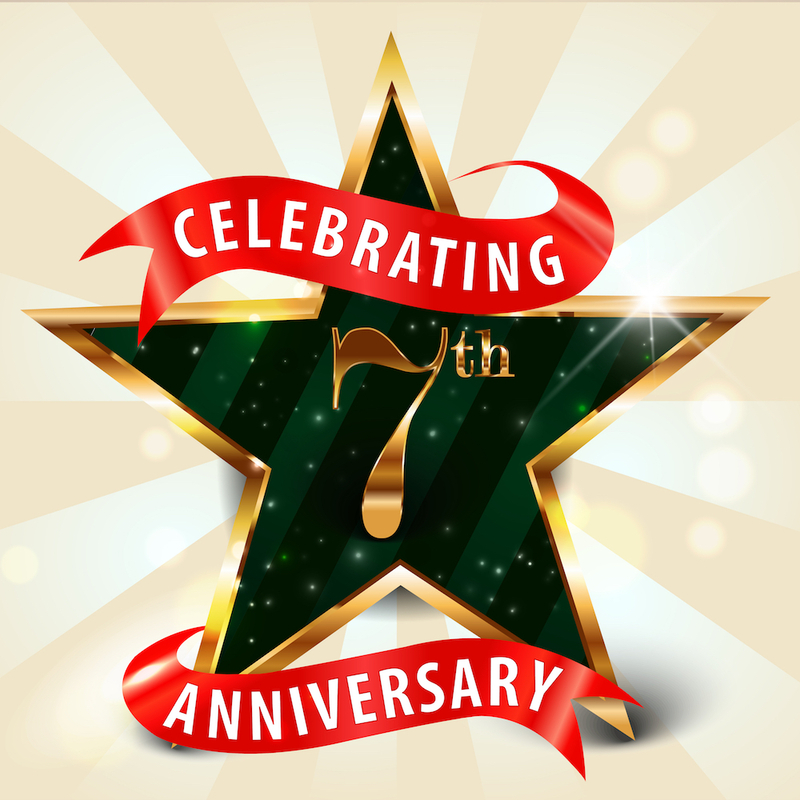 In a Dec. 3 email, county Media Relations Officer Ashley Lusby told the News Leader that FDOT also has informed county staff that it plans to move up its funding allocation for its construction of the River Road improvements from the West Villages Parkway to Interstate 75. Instead of keeping that project in the 2024 fiscal year, as the department had announced earlier this year, FDOT is preparing to undertake the work in the 2021 fiscal year. Lusby pointed out that the change in the timetable will allow for the construction of all of the River Road improvements from U.S. 41 to I-75 to begin in FY21, as the county already had scheduled its River Road project from U.S. 41 to West Villages Parkway for the same year. County Administrator Jonathan Lewis conveyed the news to the commissioners in an email late last week, the News Leaderlearned. He had spoken with L.K. Nandam, FDOT’s District One secretary, who is based in Bartow. That announcement followed the news that the county had won approval for a $14-million loan from the State Infrastructure Bank (SIB), to enable the county to proceed in FY21 with its part of the River Road work; FDOT likewise had “secured SIB approval,” Lewis noted. 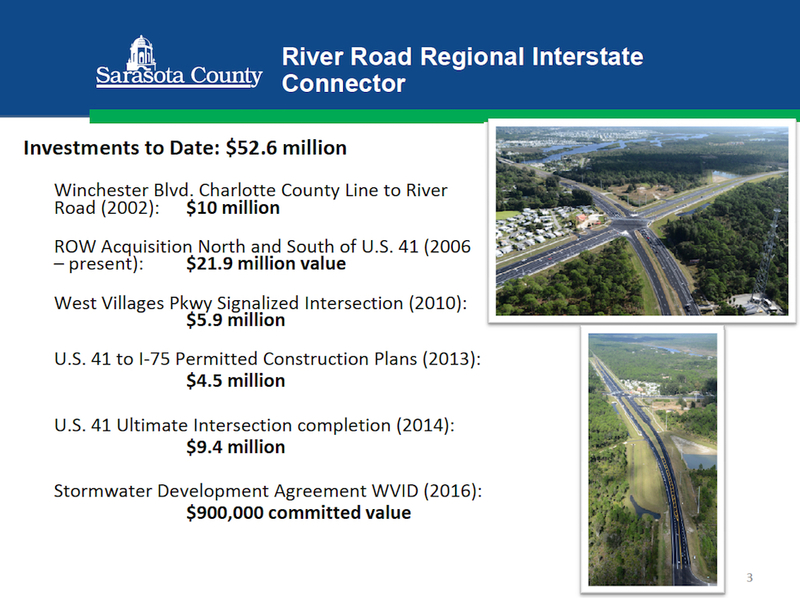 Additionally, in a Nov. 30 email to City and County of Sarasota members of the Sarasota/Manatee Metropolitan Planning Organization (MPO) board, MPO Executive Director David L. Hutchinson pointed out that the total funding for River Road work from U.S. 41 to I-75 in the department’s work program for FY21 would be $73,863,116. Lewis had informed the commissioners in early October that the City of North Port had committed $6 million toward the county’s expense for its part of the project. Hutchinson added that the construction had been included along with the previously funded planning and environmental work phase. “The project will be constructed as a Design/Build project using State Infrastructure Bank (SIB) loans,” Hutchinson noted. In a Nov. 29 email, Commissioner Christian Ziegler responded, “Love this news. Ziegler also is the GOP committeeman for Sarasota County, and he previously worked on the staff of U.S. Rep. Vern Buchanan of Longboat Key. 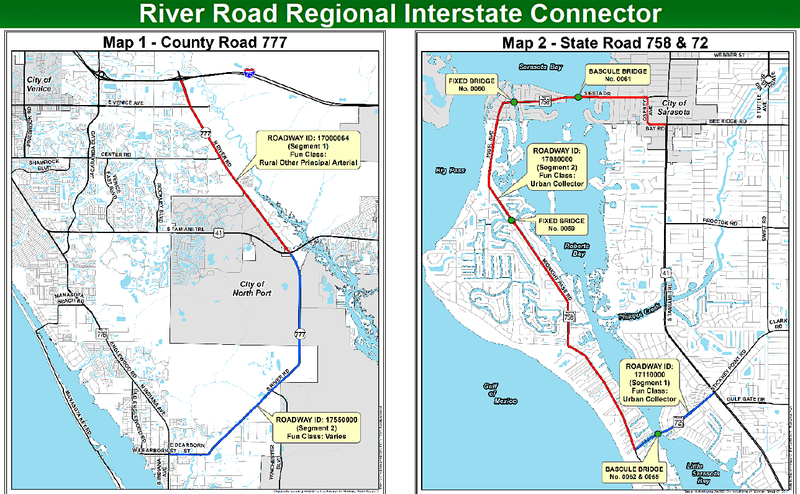 On May 22, the commissioners agreed on the facets of the road swap, which would entail their commitment to assume authority over Stickney Point Road and Siesta Drive west of U.S. 41, excluding the drawbridges — which the state would continue to control — as well as Higel Avenue and the segment of Midnight Pass Road north of the Stickney Point Road intersection. In exchange, the state would assume authority over River Road. County leaders had proposed that in late 2017 as a means of accelerating the widening and other improvements of River Road that commissioners have sought for decades. 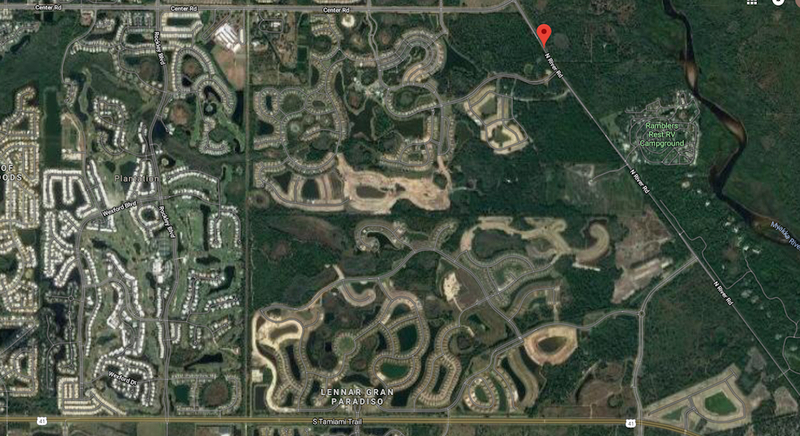 On Oct. 9, the commissioners voted unanimously to approve an agreement with FDOT for the project development and environmental re-evaluation (PD&E), right of way acquisition, and design for the improvements to River Road between U.S. 41 and Interstate 75, at a cost of $3.5 million. FDOT staff had told county leaders that as long as River Road remained a county road, it would have a lower priority on the department’s work program lists. Only if River Road became a state road, FDOT representatives pointed out, would the department be able to consider speeding up the scheduling of the improvements. The commissioners welcomed the news of the road swap negotiations when then-County Administrator Tom Harmer announced them. Burgeoning home construction in Venice and North Port, the coming relocation of the Atlanta Braves’ Spring Training operations to a new West Villages facility, and concerns Hurricane Irma underscored about the need for a much better evacuation route for both South County residents and Charlotte County residents were primary factors board members cited in supporting the idea. However, details had to be ironed out, including what specific responsibilities the county and the state would have. Even as the talks progressed this year, the first sign that the deal might not be concluded before Dec. 31 came in June. Maio conferred with Chair Nancy Detert and then-Commissioner Paul Caragiulo, who also had attended the MPO meeting, as the commission’s other representatives, to ensure their understanding of the comments was the same as his. “Yeah,” Detert confirmed Maio’s recollection of the timeline. Subsequently, though, county staff reaffirmed the timeline calling for the conclusion of the swap by the end of this year.